Use a pestle and mortar to grind the peanuts, keeping them fairly coarse. Reserving a small handful to serve, place the nuts in a large bowl. Peel and grate in the garlic and ginger (keep the ginger skin on if organic), then stir in the remaining spice rub ingredients along with 1 pinch of sea salt and 1 teaspoon of coarse black pepper. Add the diced goat and massage the rub thoroughly into the meat. Peel and quarter the red onion, then deseed and cut the peppers into chunks. Thread the onion, peppers and goat onto your skewers. 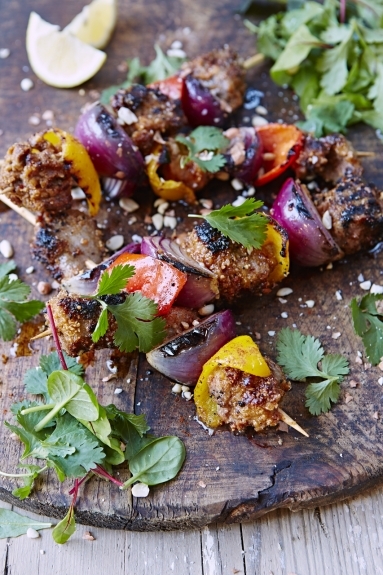 As ever, the longer you can leave your meat to marinate the better it will be, so if you have time, leave the skewers in the fridge for at least 1 to 2 hours, or preferably overnight. Take the skewers out of the fridge and sit at room temperature for a few minutes while you get the grill or griddle pan hot. Baste the meat with a little oil, sea salt and black pepper before putting it under the grill or on the griddle – it should sizzle but don’t move it! Turn only every 2 minutes, until each side is seared through (for medium-rare) or every 3 minutes on each side for well done. Allow to rest for 2 minutes, then scatter over the reserved peanuts and a small pinch of chilli powder. Tear over the coriander leaves, then serve with a fresh seasonal salad. Boom! Summer spice in your mouth! 1. Place each duck breast between two lengths of plastic wrap, and gently pound with a rolling pin or meat mallet until thin. 2. Set out three shallow bowls. Place the flour, sea salt and pepper in one, the eggs in the second, and the breadcrumbs and orange zest in the third. 3. Heat the oil in a large frying pan. 4. Spread the mustard over one side of each duck breast, then coat both sides lightly in flour, dunk it in the beaten egg, and coat it in the crumbs. 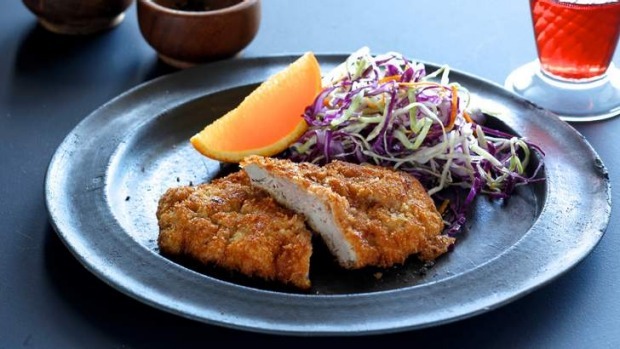 Cook two schnitzels at a time for three minutes or until golden, turn and cook to your liking on the other side. 6. Add a little extra oil to the frying pan and cook remaining schnitzels. Serve with orange wedges and a crisp salad or finely shaved cabbage slaw. 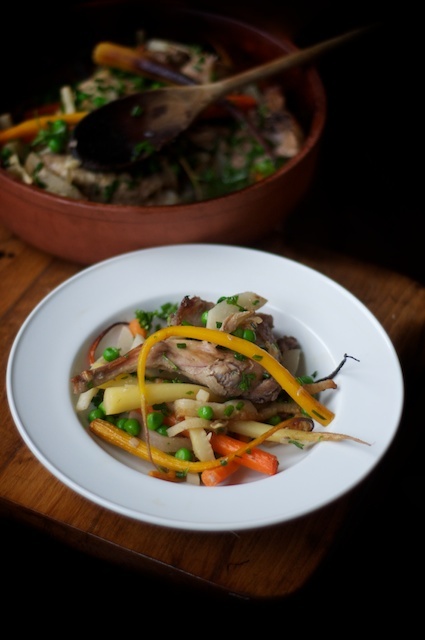 A mild dish, gently flavoured with fresh mixed herbs, rabbit in Riesling is simple, deeply nourishing and light. Don’t have rabbit? Substitute chicken in this dish for an equally good, if less distinctive alternative. Preheat the oven to 350 degrees Fahrenheit (175 Celsius). Melt the butter in a skillet over a moderate flame until it foams. Toss in the shallots, frying until they release their perfume and turn translucent. Brown the rabbit pieces in the butter and shallots, about two minutes on each side. Transfer the rabbit to a clay baker or Dutch oven, then toss carrots, turnips and celeriac into the skillet, frying until fragrant, about five or six minutes. Transfer vegetables to the clay baker or Dutch oven with browned rabbit pieces. Pour wine into the clay baker or Dutch oven, then cover and bake at 350 degrees Fahrenheit (175 degress Celsius) for two and a half hours. Remove the lid, stir in the peas. Replace the lid and continue cooking for an additional thirty minutes. After the rabbit is cooked through, remove it from the oven and stir in chopped herbs and fresh cream. Trim the birds of their feet, wingtips and heads, as necessary. Spatchcock them as described above. Combine all the marinade ingredients in a large mixing bowl. Add the quail to the marinade and use your hands to toss well so the birds are evenly coated. Cover with plastic wrap and leave to marinate in the refrigerator overnight. When ready to cook, preheat your barbecue or grill to medium–high and season the quail lightly. Brush the grill with a little oil and place the birds, skin-side down, over the heat. Grill for around 2 minutes, then turn and grill for 1 further minute or so, or until cooked. Be careful not to overcook them – the breast meat should still be a little pink. 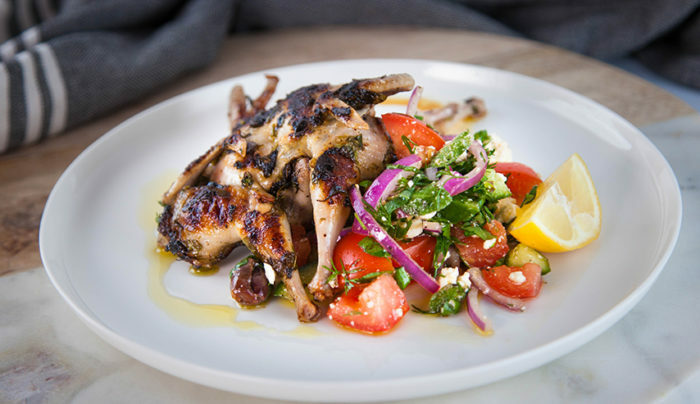 Serve the quail hot from the grill with lemon wedges, a drizzle of extra-virgin olive oil and salad. 01 Heat olive oil in a large heavy-based saucepan over medium heat, add duck and cook, stirring, for 6-8 minutes or until brown, then transfer duck to a plate. Add onion and garlic and cook for 5 minutes or until tender, then add herbs, carrot, celery and cook, stirring, for 3 minutes. 02 Add tomato paste and cook for 5 minutes, then add potatoes and chicken stock. Return duck to pan and bring to the boil. Season to taste with sea salt and freshly ground black pepper. 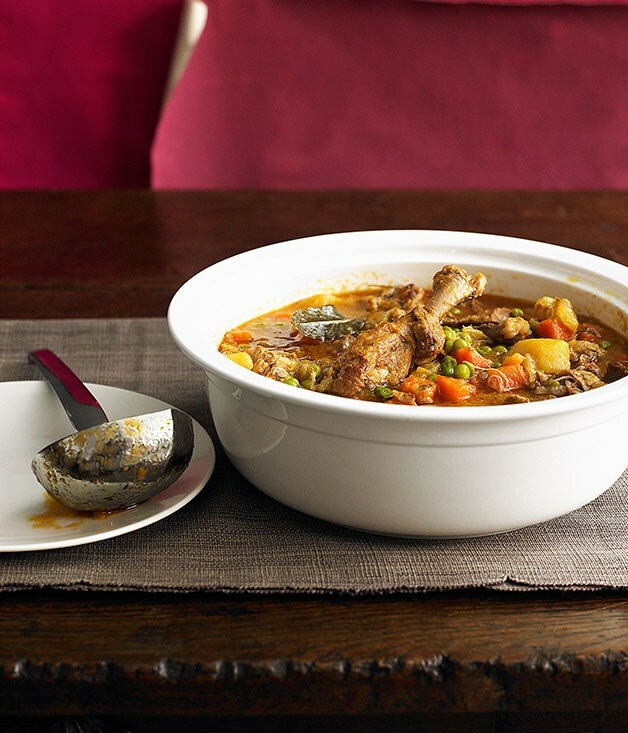 Partially cover with a lid and reduce heat to low, simmer for 3 hours or until duck is tender. Stir through peas and cook for 5 minutes. Ladle stew into bowls and serve.